I finally finished the Flippy Face Pirate. His name is Captain Cutup. I went through a few names; Capt. Cuthbert (turns out he's a real person), Capt. Cut Throat (too violent). But with the help of my wife Jane we came up with Cutup. Jane also wrote some great poetry for me, which I changed around (can you say control freak). What took the most time was the sword arm. I had to work to get it to rotate so the sword would not rub on the hat. 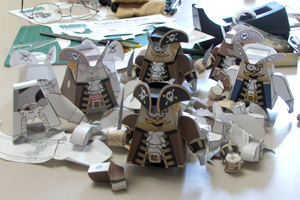 Here's a pic of the pirate debris. And check out the great instructions I made for the pirate.